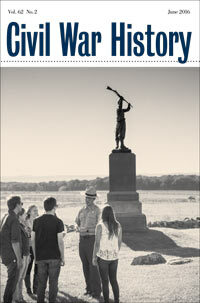 In March 2013, hundreds of academics, preservationists, consultants, historical interpreters, museum professionals, living historians, students, K-12 teachers, and new media specialists gathered in Gettysburg, Pennsylvania to assess the state and potential future of the study of the American Civil War. The essays in this special issue build on the themes of that conference: embracing the democratic and civic potential of historical thinking; reaffirming the power of place and the importance of specific, focused stories; integrating military, political, social, cultural, and gender history; and encouraging collaboration among historians working in different settings. Our three guest editors offer their own thoughts about the state and potential future of Civil War history. Although a strong counter-memory emphasizing slavery, emancipation and the service of the USCTs was promoted by black organizations throughout the 1950s and 60s, Americans would have been hard pressed to find these themes discussed at historic sites, including battlefields managed by the National Park Service. In this essay, our three authors explore the history of emancipationist memory integration into the larger narrative of Civil War history and offer their own experiences on how places like Petersburg and Chancellorsville can incorporate race, slavery, and emancipation into the larger dialogue on the significance of the Civil War. This essay explores the ways in which historic sites have started to incorporate more gender history, or rather women’s history, failing, at times, to account for the fluidity of gender in shaping how people navigate the political and material realities of their particular historical world. Through an examination of the Richmond Bread Riots of 1863 and the Second Connecticut, our two NPS historians provide useful and innovative ways for placing gender studies on the front burner on the stove of Civil War interpretation. Carmichael shares his experiences of portraying Corporal Bobby Fields at Appomattox Court House National Historical Park in the summer of 1985. He uses Fields as a conduit to explore the scholarship pertaining to the common soldier of the Civil War and how material culture can provide a new window into understanding of making the battlefield come alive for visitors. Noyalas poses the question of why some members of the general public are unwilling to embrace Civil War memory. He offers several ways historians can meaningfully engage the millions of visitors to Civil War sites annually by using memory to broaden their understanding of the conflict’s meaning through monument interpretation, battlefield commemoration, and landscape changes. Christian Keller and Ethan Rafuse share their experiences on leading a staff ride, which is a unique opportunity, buttressed by primary and secondary sources, to visit a Civil War battlefield and hone and inspire critical and creative thinking skills as they pertain to issues of command and control. James J. Broomall is assistant professor of history and director of the George Tyler Moore Center for the Study of the Civil War at Shepherd University in Shepherdstown, West Virginia. Peter S. Carmichael is Robert D. Fluhrer Professor of Civil War Studies and director of the Civil War Institute at Gettysburg College. He is currently finishing The War for the Common Soldier for the University of North Carolina Press’s Littlefield History of the Civil War series. Emanuel Dabney is the curator at Petersburg National Battlefield, where he has worked since 2001. Robert Dunkerly is a park ranger at the Richmond National Battlefield Park and the Maggie L. Walker National Historic Site. Christian B. Keller is professor of history in the department of National Security and Strategy at the United States Army War College, Carlisle, Pennsylvania. Among other books and articles, he is the author of Chancellorsville and the Germans: Nativism, Ethnicity, and Civil War Memory, and is currently at work on a new book about confederate strategy in the east. Kevin M. Levin is an educator and historian based in Boston. He is the author of Remembering the Battle of the Crater: War as Murder (2012) and you can find him online at Civil War Memory [http://cwmemory.com]. Ashley Whitehead Luskey is an instructor in the history department at West Virginia University and also works with the Civil War Institute at Gettysburg College. She is a former historian and interpreter with the National Park Service at the Richmond National Battlefield Park. Jonathan A. Noyalas is assistant professor of history and director of the Center for Civil War History at Lord Fairfax Community College in Middletown, Virginia. He is the author or editor of eleven books, including Civil War Legacy in the Shenandoah: Remembrance, Reunion, and Reconciliation. Beth Parnicza is a park historian at Fredericksburg and Spotsylvania National Military Park, where she also supervises the Chancellorsville Battlefield Visitor Center. Ethan S. Rafuse is professor of history at the U.S. Army Command and General Staff College in Fort Leavenworth, Kansas. He is the author of numerous books, including Stonewall Jackson: A Biography and Robert E. Lee and the Fall of the Confederacy, 1863-1865. Jill Ogline Titus is associate director of the Civil War Institute at Gettysburg College and the author of Brown’s Battleground: Students, Segregationists, and the Struggle for Justice in Prince Edward County, Virginia. Foote, Lorien and Kanisorn Wongsrichanalai, eds. So Conceived and So Dedicated: Intellectual Life in the Civil War-Era North. Reviewed by Michael E. Woods. Gallman, J. Matthew. Defining Duty in the Civil War: Personal Choice, Popular Culture, and the Union Home Front. Reviewed by Steven J. Ramold. Myers, Barton A. Rebels Against the Confederacy: North Carolina’s Unionists. Reviewed by David Silkenat. Zimring, David Ross. To Live and Die in Dixie: Native Northerners Who Fought for the Confederacy. Reviewed by Timothy J. Williams. Towne, Stephen E. Surveillance and Spies in the Civil War: Exposing Confederate Conspiracies in the American Heartland. Reviewed by Mark Lause. Harlow, Luke. Religion, Race, and the Making of Confederate Kentucky, 1830-1880. Reviewed by A. Glenn Crothers. Dean, Adam Wesley. An Agrarian Republic: Farming, Antislavery Politics, and Nature Parks in the Civil War Era. Reviewed by R. Douglas Hurt. Hurt, R. Douglas. Agriculture and the Confederacy: Policy, Productivity, and Power in the Civil War South. Reviewed by Adam W. Dean. Arenson, Adam and Andrew R. Graybill, eds. Civil War Wests: Testing the Limits of the United States. Reviewed by Al McLean. Inskeep, Steve. Jacksonland: President Andrew Jackson, Cherokee Chief John Ross, and a Great American Land Grab. Reviewed by Mark R. Cheathem. Rafuse, Ethan S., ed. Corps Commanders in Blue: Union Major Generals in the Civil War. Reviewed by John Patrick Riley. Davis, William C. Crucible of Command: Ulysses S. Grant and Robert E. Lee-The War They Fought, the Peace They Forged. Reviewed by Patrick S. Brady. Harris, M. Keith. Across the Bloody Chasm: The Culture of Commemoration among Civil War Veterans. Reviewed by Jacob Clawson. Gallman, J. Matthew and Gary W. Gallagher, eds. Lens of War: Exploring Iconic Photographs of the Civil War. Reviewed by Joshua Shiver.